Looks like the owners of the recently opened fast-casual Mediterranean spot the Hummus and Pita Co. (585 Avenue of the Americas, 212-510-7405) had the Chipotle concept in mind when figuring out the plan for their new eatery. First you pick your protein (falafel, vegetarian salads, gyro, shawarma, chicken, steak, or taboon chicken or steak, ranging from $4.95 to $8.95), then stuff it into a pita, laffa, bowl, or platter, fill that with hummus plus an assortment of other hot and cold salads, top that with raw veggies, and sauce the whole shebang with a condiment. Needless to say, there are countless permutations here to get your Mideastern lunch fix. Service was a bit hectic and rushed, and it's a bit overwhelming trying to decide how, exactly, to fashion your sandwich, but the food is good, not to mention doled out in huge portions. We ordered the chicken shawarma on laffa, a chewy bread made in the taboon oven, and topped it with hummus, Israeli salad (chopped cucumber, tomato, and onion), sumac-coated onions, and shug, a spicy cilantro-and-chile sauce. The wrap was ginormous and the chicken moist and well-flavored. All around, a tasty lunchtime sandwich -- one that we'd definitely get again, though we might swap harissa for the shug since it wasn't quite as spicy as we would have liked. We also opted for the vegetarian plate, to which we added hummus, grilled vegetables, beet salad, tabouleh, and chickpea salad. While the hummus was creamy and worked well in a sandwich with lots of other flavors going on, on its own it fell a little flat, as though it needed a touch more lemon and/or tahini. The veggies were nicely cooked, though, not too overdone, and the beet salad was refreshing. We were somewhat less into the tabouleh, wishing the bulghur-to-parsley ratio wasn't as high as it was, but still not a bad version. Like the laffa wrap, the veggie plate was amply portioned, enough for lunch and leftovers for the next day. 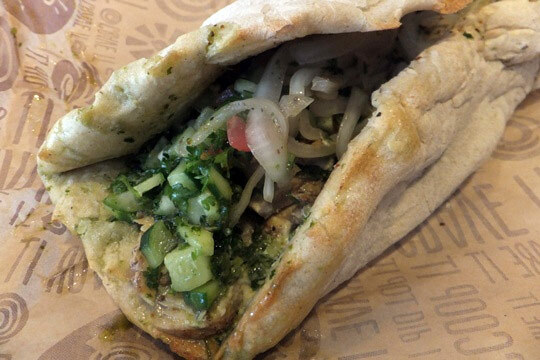 True, Hummus and Pita Co. isn't the first fast-casual Mediterranean spot, and you can find similar fare at Meze Grill or even at the gyro sellers on the city street corners. But it's a convenient, flavorful spot for those who work or live in the area, and, if the Chipotle effect works its magic, it's likely to be the first of many to come.